You are here: Activities / Literature for all children! Series of activities for children from regular and special schools in the Sarajevo Canton will be organized by the foundation Cultural Heritage without Borders (CHwB) and the Museum of Literature and Performing Arts of Bosnia and Herzegovina within the joint project, “Literature for all children”. The project “Literature for all children” aims to promote innovative social and educational role of literature, as well as to engage children of regular and special primary schools in culture and literature. Workshops, exhibitions, guided tours, round tables and a theater play inspired by the literary works of Bosnian children story authors, Ahmet Hromadzic and Branko Copic, will be as a part of the workshop. The stories written by these authors will be translated into Braille, and recorded in audio and video form with sign interpretation. Financial support for this project in the amount of KM 5,360 was provided by the Ministry of Labour, Social Affairs, Displaced Persons and Refugees of Sarajevo Canton. 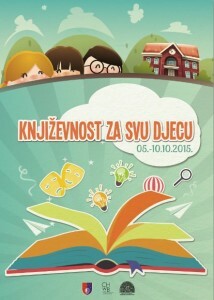 All activities under the project will be implemented during the “Children’s Week”. 99 children from 8 regular and special schools participated in 5 workshops. 20 teachers and educational workers participated in a roundtable discussion on importance of inclusion in elementary school.